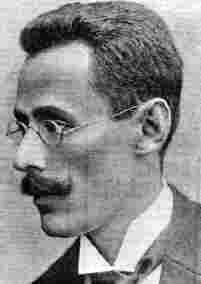 Dawid Markelowicz Janowski (pronounced yanofsky) was born in Wolkowysk, Poland on June 7, 1868. He moved to Paris in 1890. In 1894 at age 26, he beame a professional chess player. Janowski was playing in Mannheim in 1914 when World War I broke out. After a short internment he was allowed to travel to Geneva, Switzerland. The Russian consul issued him a passport, and in December 1915 he went to the USA. He stayed in New York for nine years before returning to Paris. In December 1926 he travelled to Hyeres, France to play in a chess tournament, but died of tuberculosis on January 15, 1927. A fund was raised to meet his funeral expenses. He died in poverty. Janowski may have peaked to an ELO rating of 2600 in 1905 and has an ELO historical rating of 2570. Janowski was an addicted gambler. At a tournament in Monte Carlo, he gave all his money to a friend and made him promise not to return the money until after the chess tournament. However, the lure of gambling was too much and he asked his friend to return his money to go gambling. His friend refused. Janowski later sued his friend over the incident. Janowski had a chess patron, the Dutch painter Leo Nardus, who supported him in chess for many years. One day Nardus suggested an alternate move during a postmortem of one of Janowski's games. Janowski called Nardus an idiot in front of a crowd of people. Nardus never gave Janowski any financial support after that.